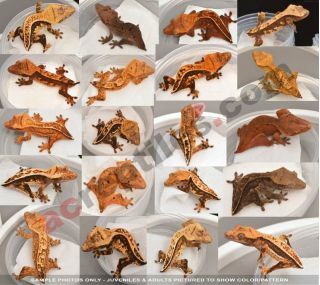 High-End Wholesale Lots :: High-End Wholesale Crested Gecko Hatchlings - Tailless - Assorted Morphs - New Additions for 2019! 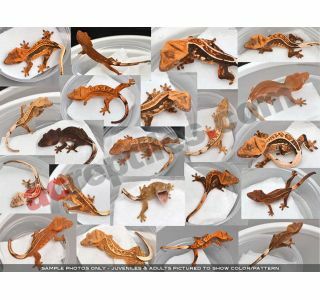 Home/High-End Wholesale Lots/High-End Wholesale Crested Gecko Hatchlings - Tailless - Assorted Morphs - New Additions for 2019! High-End Wholesale Crested Gecko Hatchlings - Tailless - Assorted Morphs - New Additions for 2019! Minimum quantity for "High-End Wholesale Crested Gecko Hatchlings - Tailless - Assorted Morphs - New Additions for 2019!" is 10. First Come, First Served...No holds or payment plans on these. AC will be hand-picking these and will do his best to accommodate reasonable requests. Because this is a wholesale offer, we are unable to meet requests asking us to exclude particular morphs/traits. Minimum Order 10 - Order any number you want, as long as it’s 10 or more. This offer is perfect for online retailers, show vendors, reptile specialty shops, and experienced breeders looking to diversify their colonies (but not recommended for novice gecko keepers). Those of you who remember our "Motherload" offer a few years ago know that those were awesome geckos for the money, especially at that time. That package was so popular that we were almost always sold out and taking pre-orders...the breeders and vendors selling them at shows were selling out, breeders who bought a group and raised them for 6 months wanted more when they saw how nice their geckos were turning out, and there was a steady backlog all summer/fall. Well, we're doing it again this year, and these geckos are at least a couple generations more advanced. You will not find a better deal or nicer geckos for the money anywhere, and I will guarantee that. In fact, your complete satisfaction is guaranteed or you can ship them back the next day for a refund, no questions asked. The following and more will be included in these groups…no average geckos - these are the ones that are far too nice to go to our regular pet store distributors. You will usually see a good number of full pins with excellent color and structure from many of the various projects listed below. I actually coined the term "lateral striping" back in the mid-2000's and we've been focused on awesome lateral markings ever since. You'll see evidence of that in a lot of the Pinstripes and Phantom Pins that you get. Red Harlequins, which later developed into Red Pinstripes, were our first designer crested gecko project and we produce a ton of them today. Next generation breeders added in 2018 - crazy stuff coming out of these now! We produce some of the brightest and cleanest colored yellows and oranges in the hobby, largely due to the development of the "C2" cream-on-cream project and what it eventually did for our Citrus project. Red, Citrus/C2, Tangerine, Lavender/Black & Halloween Color Varieties. Pattern variants include Quad Stripes, Dalmatians, Etc. Only if they’re extremes - no standard harlequins. We are now including some low to medium white examples of the popular Whiteout or "Whitewall" lateral markings. We're currently doing a ton of outcrossing with the ever-exciting Soft Scale project, so there are going to be a number of Soft Scales in these lots that will become much more obvious with a little age. Because of the number of geckos in each project and the fact that we're constantly improving each project, our high-end geckos GET PROGRESSIVELY NICER EVERY YEAR. Top Notch Quality - Satisfaction Guaranteed. We want you to be thrilled, and you absolutely should be with these. But if you’re not, ship them back the same day you receive them (that’s the only catch - has to be that same day - we cannot take geckos back that have been housed in your reptile room) and we’ll issue a full refund. Why would we sell super nice crested geckos at wholesale prices? Bottom line, we're a large producer and we can't retail all of them - there's just no way possible. Yes, it's a screaming deal...but the catch is you have to take a pretty serious number of geckos, and you have to put the work into raising them (or selling them individually). This is a no-brainer of a deal for breeders, dealers, and specialty reptile store owners. This is, however, not recommended for those who've never dealt with a number of hatchling crested geckos before, as the care requirements are a bit more strict for the first 60 or so days of a crested gecko's life. Quite frankly, we know there are a lot of competing breeders online who will readily tell you these geckos aren’t as nice as we say...but, as the saying goes, talk is cheap...of course, that's a convenient and risk-free thing to say for a competitor who's afraid they're going to end competing with YOU. That being said, we will put our money where our mouth is by GUARANTEEING THAT THEY ARE! And no - it isn't too good to be true…if you’re a breeder, you know we’re not just printing money. You still have to do the work of raising them, taking photos, and/or setting up at shows. This is a way fellow breeders, show vendors, and reptile specialty store owners can help us move some awesome geckos, and supplement their own production, or offer something different and unique to their customers. 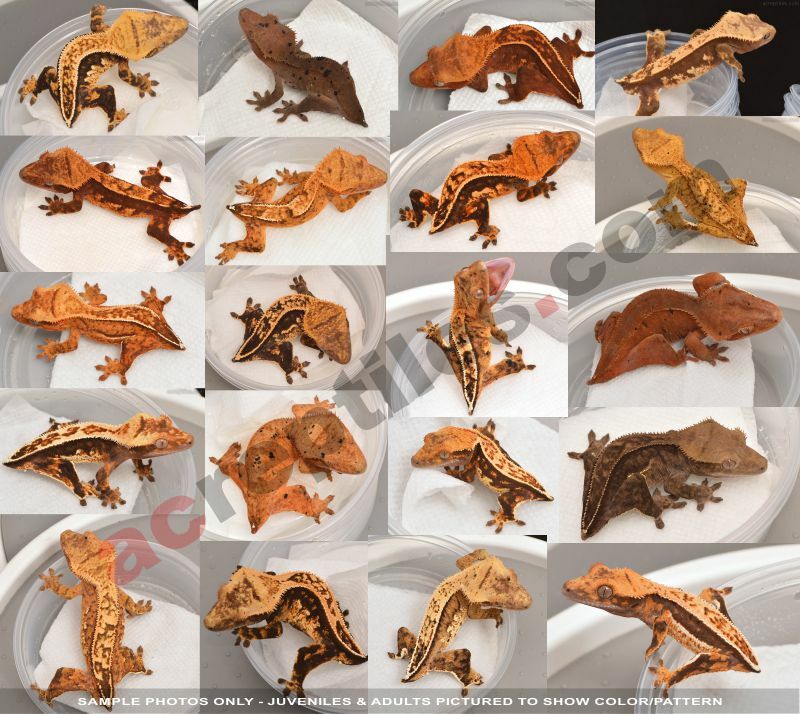 PHOTOS ON THIS PAGE ARE EXAMPLES OF JUVENILE AGED GECKOS SOLD IN PREVIOUS SEASONS. YOU CAN FULLY EXPECT GECKOS YOU RECEIVE TO BE AS NICE OR NICER AT THIS AGE. High-End Wholesale Crested Gecko Hatchlings - Assorted Morphs - New Additions for 2019!